I do have a confession though, I’ve only played one level of this game- on a demo disc- some 15-16 years ago. However, that was PLENTY enough to turn the gears in my head, and it’s been in the back of my mind since. Sheep Raider is a cell-shaded, 3D, linear stealth game, developed by Infogrames, based on the old Sam Sheepdog & Ralph Wolf Looney Tunes/Merry Melodies cartoons released for Windows and the original PlayStation. 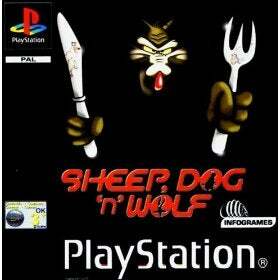 Players control Ralph Wolf (who apparently isn’t Wile E. Coyote) and try to steal sheep while avoiding Sam Sheepdog. At the player’s disposal are various Acme gadgets, as well as disguises for accomplishing this goal. I mean, I get that I write the sections and all, but come on...read that “What is it” part again and tell me you don’t already want to play. I remember a level where I placed a bottle of pheromones down and used a fan to blow the smell to the sheep to lure them. Players can also use a bush (or sheep costume!) to tip-toe past Sam. If caught, Sam will give chase and bop you on the head or punch you in the air. It’s the closest thing to playing an episode of Merry Melodies ever. Remember how I said there are various Acme products at players’ disposal? Well, while that is true, there’s only certain ones on each level, and each level can only be beaten in a specific way. So basically, the game is fun the first time you play through it, then it’s useless. So for a new Sheep Raider (still the better name), we need freedom. I want a big, open level that assumes I’m not stupid and gives a plethora of ways to accomplish my goal. Every level begins with Sam and Ralph clocking in to begin the work day. Then the player begins away from the sheep with binoculars. Study your prey, check your inventory, and attempt to lift the required amount of wooly goodness. Completing a level grants coins (with bonus coins for any extra sheep) that can be uses at the in-game, online Acme shop for new tools. These tools can be used from then on for any level. Each mission ends with Sam and Ralph clocking out. Graphically, I’d like this game to look similar to those new Road Runner shorts on The Looney Tunes Show. Ok, that was a joke. I guess WBIE are the ones who could make it, but I really don’t have a “dream studio” for this game. As long as it’s a fun stealth game- easy enough for kids, deep enough for adults- and manages to feel like playing a cartoon, I don’t really care. Now that I wrote that, I’m thinking only Nintendo could pull it off. If yinz have any ideas, drop a comment. I’ll be visiting family next week, so I may not have a post next weekend. Regardless, the next NS post will be about The Movies by Lionhead. Promise.